Some people ask, why .io ? Well, unlike other systems, we're not just about gathering raw data and enriching it (input), but deploying it to the channels you engage your customers through (output). We create a single, deduplicated, enriched view of every customer in real-time. If they cancel orders or return some goods, we know about it and update their status and value. This means accurate insights into business performance and precision marketing. Data in. Better Data out. Create selections of specific customers for your: Email, Direct Mail, Facebook Ads or Google Ads campaigns in seconds. Iterate through different combinations of customers to see how big selections are and how many people you have permission to contact. Then automatically send your selections to your Marketing Platforms or export to CSV. Fast, flexible and easy to use. 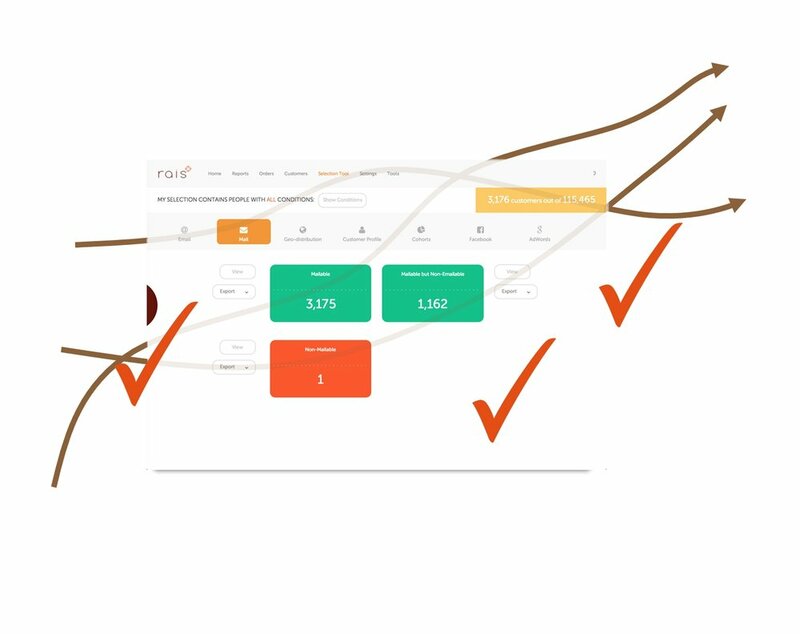 Automatically engage customers at the right moment to generate incremental first-time and repeat purchases. 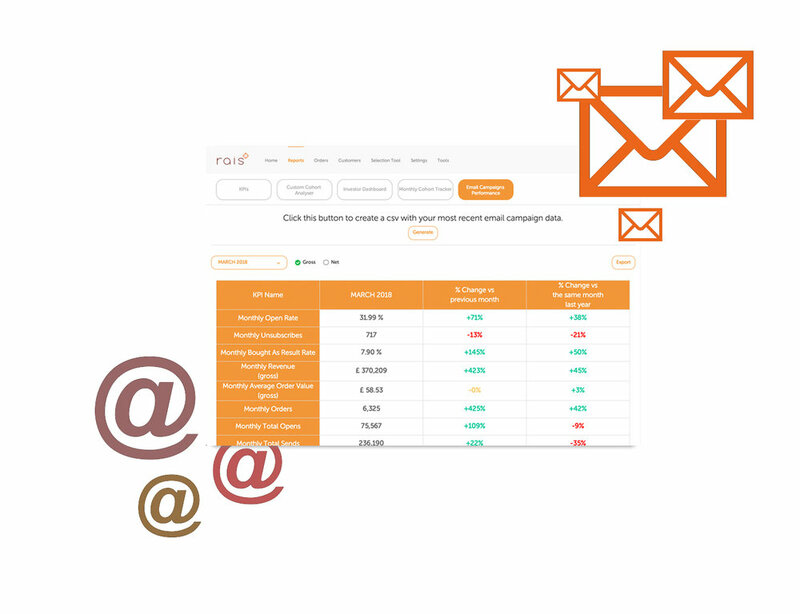 rais can automate virtually any scenario, as it talks to your communication channels in real time, triggering campaigns. Know who to contact, when, with what type of incentive (or not), to generate greater lifetime value. We enable outbound teams to focus their time on contacting the right customers, at the right moment, with greater context. Increased conversions + Happier customers! Easily identify different types of promotional customer and expose targeted offers to them across marketing channels, without having to promote mass discounts as often. rais makes it easy to ensure you don't waste budget exposing ads to people, who have already bought a specific item or category you're marketing. It's equally easy to re-market to people who've not responded to an email or promotion. rais updates audiences dynamically ensuring only the right people see your messages. Our real-time analytics algorithms create enriched, meta-profiles of each individual customer tailored to your specific business model. Using this data enables you to engage with individual customers in the best way with improved context of their situation. More empathy brings them one step closer to advocacy. Whether it's planning a new campaign or understanding the impact of your recent marketing activity, rais lets you understand the behavioural and demographic profile of customer segments. This really helps when it comes to the positioning of campaign incentives, imagery and copy. Easy to view and understand insight reports means everyone across the business understands the reasons behind performance gains/dips and can make the right decisions to exploit/mitigate. More informed, more strategic, more profitable.